Audio quality in an phone is an aspect that many of us ignore, but most of us use all the time. After all, who still uses an iPod these days? Over the last couple of years we've seen real progress in the quality of phone speakers, and even the hardware that pushes out sound to your headphones. But which is the best phone for music? We're going to run down our favourite phones for tunes, taking several factors into account. Do you need to use an adapter just to plug in some headphones? Does the phone have great internal speakers? And does it have the power and DAC quality to do justice to a truly great pair of headphones? All these things matter. You just need to choose which matters most because right now our top picks each take a slightly different approach to sound. As every company is starting to take the headphone jack out of their phones, Samsung held firm and kept the handy 3.5mm jack in the Galaxy S9 and S9 Plus. This is a huge benefit if you have a pair of earphones or headphones you love. Jack-less phones may often come with an adapter, but the chances of losing it are high. Plus they're flat-out annoying. Samsung also worked with AKG to improve the quality of its speakers. There's a driver on the bottom, and the earpiece speaker now outputs audio too, avoiding the lopsided effect of a single driver array. It goes loud, so loud you'll only need max volume for a few scenarios. 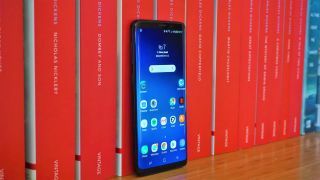 The Galaxy S9 and S9 Plus don't have a turbo-charged quad DAC, though, so this is a top choice for those after general music performance rather than a match for demanding audiophile headphones. The LG V30 is one of the best Android options for those who already own great headphones or earphones. First, it has a headphone jack. Its 32-bit DAC is more interesting, though. This is what turns digital audio files into the signal your earphones actually "play". To get specific, it's a 32bit ESS Sabre ES9218P DAC. This reduces harmonic distortion in the signal, and can increase dynamic range. The LG V30 is also better at handling more power-hungry headphones than most, although these days there's a good chance your pair doesn't need a particularly powerful amp. The phone's actual speakers aren't best-in-class, but if you're super-picky about sound quality you won't be impressed by any phone speaker anyway. You also get a better-than-average pair of B&O earphones in the box. If you've heard of Razer, it is probably thanks to its gaming hardware and accessories. But it now makes a phone too, the Razer Phone. Speaker quality is one of its top features. There are larger-than-average drivers above and below the screen, delivering loud stereo sound. For pure volume, the Razer Phone is yet to be beaten. It's super-loud. Dolby Atmos processing helps the Razer Phone sound big as well as loud too. It does get a little sharp at top volume, though, so you'll want to knock the volume slider down a bit if you're holding it rather than using it to play Spotify while you cook or have a shower. Like so many recent phones, the Razer Phone does not have a headphone output, which is a shame. However, its supplied adapter does have a 24-bit DAC built-in. Apple rarely makes much fuss about the speakers on its phones. However, the iPhone X is comfortably its best-sounding phone yet, with loud and balanced dual drivers. There's one on the bottom edge, and the earpiece speaker outputs sound for better dispersal when you hold the phone in front of your face. As you probably know already, the iPhone X does not have a headphone jack, though. It's Lightning connection all the way here, and that means the DAC lives in your wireless/Lightning headphones. Use a Lightning to 3.5mm socket adapter and that little thing actually has a DAC chip inside. We think the iPhone X is a great all-rounder for audio. However, if your music collection is still a mass of files rather than based in the cloud, an iPhone makes it a bit trickier to get on the phone than an Android. You need to use iTunes: this has always been the way, but is worth keeping in mind if you've never used an iPhone before. Years ago, HTC had the best phone speakers, bar none. Today it's not quite on top but the HTC U11 Plus is still a great phone for music. Its BoomSound speakers use a treble driver by the earpiece, and a primary one on the bottom. Their output isn't 100 per cent even, but they do sound good and HTC uses the body as a cavity for the top speaker to give it a bit more oomph. There's no headphone jack, which may be a deal-breaker for some of you. However, it does come with a very good adapter cable with a high-quality DAC built into its sleeve. Adapters are annoying, but this gets you good sound quality with wired headphones. For wireless pairs, the HTC U11 Plus supports aptX HD, reducing the quality loss of wireless streaming. If your set supports aptX HD, anyway. Decent music playback isn’t limited to high-end flagship phones, as the wallet-friendly ZTE Axon 7 Mini offers impressive audio on a budget. The compact phone packs pseudo-3D stereo sound made possible by dual speakers at both ends of the phone. Enhanced by integrated Dolby Atmos technology, the phone is capable of pumping out music that features more powerful bass and far less distortion than on most rival devices of a similar size and price point. An AKM 4962 chip combines the two separate audio processors to create beautiful well-rounded and surprisingly beefy sounds. With this your Bluetooth speaker will be resigned to life in the clutter cupboard. Sony was one of the original pioneers of stereo speakers in phones. It has since fallen behind a little in terms of pure sound quality, but the Xperia XZ2 is still a good all-rounder for music. The front speakers provide a good soundstage, and speaker quality has improved since the XZ1. There is, however, no headphone jack so you'll have to use an adapter if you don't have wireless headphones. The Xperia XZ2 has a couple of "special moves" too. A dynamic vibration feature fires off the vibrate motor in time with the music. Pointless fluff or fun? You choose. It also supports LDAC, a high-resolution wireless standard seen in Sony's Bluetooth headphones. For some, Hi-Res audio isn’t necessary for a smartphone to offer great music playback. For those who are perfectly happy with how MP3 quality files sound, battery life is likely to be more key. Living up to its iconic billing, that’s where the new Nokia 3310 comes in. The phone’s 1,200mAh battery might not be the biggest, but wrapped within this glorified feature phone it’s enough to offer a massive 51 hours of continuous music playback before needing a trip to the mains. No, you’re unlikely to buy this just for its musical abilities, but if you’re after a spare phone that can keep the tunes coming as your main phone’s battery circles the drain, it’s a solid option.